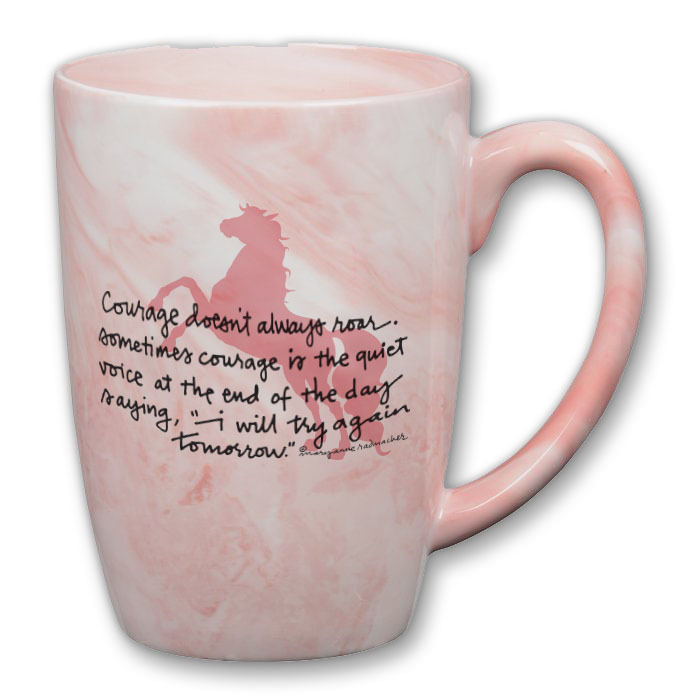 16 oz heavy ceramic mug sports the calligraphy of inspirational writer Mary Anne Radmacher. Whether your challenge is medical, equine or otherwise, this mug will offer a little support to start your day. "courage doesn't always roar. sometimes courage is the quiet voice at the end of the day saying, 'i will try again tomorrow.'" At any rate, after years of looking at that tattered slip of paper, I wondered how hard it would be to orchestrate applying Mary Anne's inspirational words to a horsey product for HoofPrints. Turns out it was not hard at all! I found Mary Anne's website, and sent her an inquiry. She promptly replied and we sorted out the financial arrangements. So now, you all can enjoy Mary Anne's powerful words with your morning coffee, and she's compensated for her lovely calligraphy and wise words. There's a fresh supply of inspiration nearly every day at Mary Anne's Facebook page here.